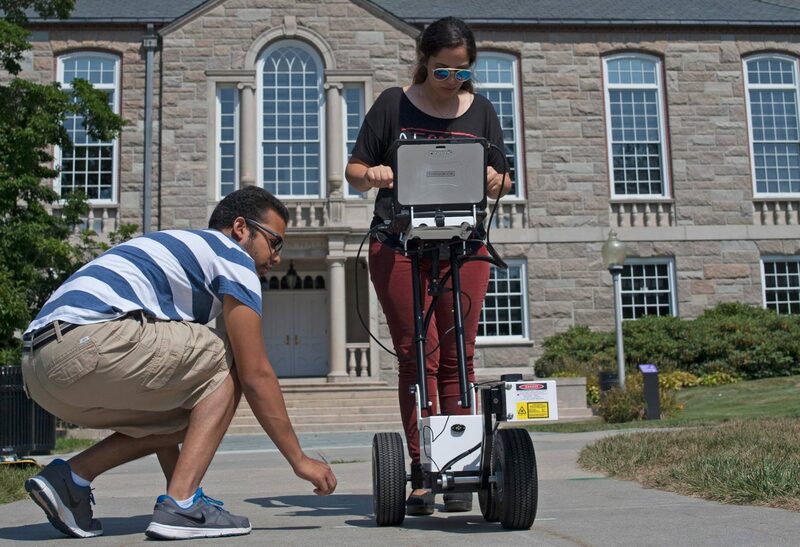 While sidewalks are often overlooked in the discussion of crumbing infrastructure, student researchers at the University of Rhode Island are working to improve accessibility across the state in a more timely and cost effective way. 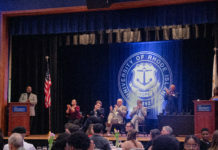 Sanaz Motamedi, who earned her Ph.D. in industrial and systems engineering last week thanks to the research she did on this project, has created a solution to bringing Rhode Island up compliance with standards set forth by the Americans with Disabilities Act. With the help of undergraduate researchers Robyn Johnson and Ulices Ortiz and a $150,325 grant from the the Rhode Island Department of Transportation, Motamedi has been able to improve the data collection process with an automated system. Using a walking profiler, or Surface Systems & Instruments (CS8900), Motamedi and her team were able to collect data for running slope, cross slope, roughness, surface conditions and level changes, just by simply pushing the machinery down the sidewalk. Apart from saving time, the walking profiler can also “automatically detect the noncompliant attributes,” according to Sanaz. The index scores would help the Department of Transportation prioritize projects that need immediate attention compared to other projects that could be put off for the time being. When collecting data out on campus, Johnson said that there were some sidewalks on campus that are in need of immediate attention. Now that Motamedi has graduated, Johnson will be in charge of leading the project next semester. During that time, Johnson will be working to further develop the sidewalk index scores and integrate the machinery into the Department of Transportation’s data collection process. Switching to this automated process will save the state an estimated $500,000 over the next five years. Johnson said she’s looking forward to the challenge. Apart from collecting all of the data need to prove that the walking profiler was effective, much of Ortiz’s work this semester also revolved around making the integration of the machinery for the Department of Transportation more seamless. “This semester has been focused on creating a standard operating procedure for the walking profiler so that when the machine gets passed on to the Department of Transportation, they have a manual on how to use the machine,” Ortiz said. Another aspect of their research also included a human assessment study which surveyed participant’s experiences walking down a sidewalk compared to rolling over it in a wheelchair. Although the sidewalk may seem to be in good condition when walking over it, the experiences participants had sitting in the wheelchair were rated significantly lower, mainly because they were not feeling many of the issues that people with disabilities face, according to Motamedi. “We need to make public transportation accessible to all people, regardless of their physical ability,” Motamedi said. Although there is still work to be done, Motamedi, Johnson and Ortiz are all optimistic about the positive potential their research holds.